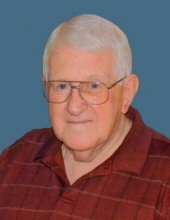 Mr. Ollie Joe McElroy, 86, of Richmond went to be with the Lord on Thursday, January 17, 2019 at the Hospice Compassionate Care Center in Richmond. Joe was born at home on July 27, 1932 in Madison County to the late Milton and Velerie Owens McElroy. He attended the old Kirksville school and went on to receive his associate degree from the Baptist Seminary in Lexington. Joe started work with the Sealtest Milk Company as a milk truck driver, and later worked for Madison Grocery in Sales for several years. After his retirement he went back to work at Ace Hardware where he enjoyed 15 years of helping and visiting with his friends there. He loved crossword puzzles, his family and especially his God. Joe was a member of the Newby Baptist Church. Funeral Services will be conducted at 11:00 AM on Saturday, January 19, 2019, at the Combs, Parsons & Collins Funeral Home, with Pastor Scott Guiley officiating. Burial will follow in the Richmond Cemetery. Visitation will be from 5-9 PM on Friday evening at the funeral home. Honorary Pallbearers will be his granddaughters. The Combs, Parsons & Collins Funeral Home, W. Main St., Richmond, is in charge of the arrangements. "Email Address" would like to share the life celebration of Joe McElroy. Click on the "link" to go to share a favorite memory or leave a condolence message for the family.